Type – Multiple Drobo models now support hard disk drives (HDDs) and solid state drives (SSDs). 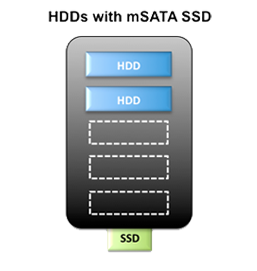 HDDs provide high capacity while SSDs provide high performance. When SSDs are supported, they can be used alongside HDDs, so you can have both capacity AND performance. Grade – Quality is important when deciding what drive to use. If you will be actively using the drives most of the day in a business environment, for example, you should use enterprise-grade drives. Enterprise drives have higher MTBF (Mean Time Between Failures), which is a good thing when used with applications in continuous use. 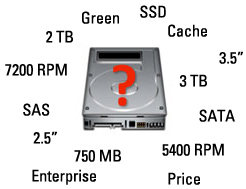 RPM – When it comes to disk drive performance, the speed at which the disks spin is very important. Choose faster spinning drives (≥ 7200 RPM) for applications that can take advantage of higher-performance storage. For example, so-called "Green" (≤ 5600 RPM) drives have the lowest RPM rating and will be the slowest performing drives in a Drobo. For optimal performance, it's best not to mix 7200 RPM drives with slower drives. Also, it is not recommended to mix significantly different RPM speeds, such as 7200 RPM with 15,000 RPM in a Drobo B1200i. Capacity – With Drobo, you can choose the capacity that you need today and expand with larger capacity drives in the future. Remember, with drive redundancy in arrays such as Drobo, one or more drives is used to store parity data. Use the Drobo Capacity Calculator for specific information. Form Factor – All 3.5" drives are compatible with all Drobo models except the Drobo Mini. The Drobo Mini accepts 2.5" drives that are between 7 mm and 9.5 mm in height. Drobo's carrier-less design, requires no tools or screws to install. Cache – Most modern drives have a good amount of internal cache (32 or 64 MB), so this is not a critical deciding factor. Interface – All Drobos use SATA (SATA II/III) drives, but the Drobo B1200i can also use SAS drives. The main difference is that SAS drives are dual-ported, enabling a high-availability architecture such as can be found in the B1200i. Number of Drives – In all storage arrays, the more drives installed, the faster the performance. For example, if you are using a B800i in a VMware vSphere cluster, consider using 8 enterprise-grade drives instead of a smaller number such as 4. The same goes for the B1200i, where 12 drives are better for IOPS than 6. When using SSDs in a B1200i, most optimal drive configuration for virtual server primary storage is 9 SAS drives and 3 SSDs (dual disk redundancy enabled). A minimum of 6 hard drives is recommended with 3 SSDs. Price – Despite the many other things to consider, often the #1 deciding factor when people purchase drives is price. Since performance, reliability, and energy efficiency are also key purchase criteria, price should not be the only consideration. Purchasing high-quality drives will give you a better storage experience by reducing the chance of having to replace or rebuild a drive—ultimately saving you money. Drobo let's you take advantage of mix and matched drives to maximise your storage capacity and minimise up front investment and costs over-time. While the Drobo Mini utilises small form factor 2.5" drives the rest of the Drobo products use the large form factor 3.5" drives. This guide will focus on the 3.5" drive and SSD technologies to help you select the right drives for your application, allowing you to balance acquisition costs and performance requirements versus capacity requirements. Notes: 1 NL SAS or Nearline SAS drives have a SAS interface, but leverage the same head, media, and rotational speeds of traditional Enterprise SATA drives. They are ideal for Enterprise applications that have high capacity requirements. Consult the Drobo.com Knowledgebase for a list of mSATA SSDs and SSDs with the corresponding 2.5″to 3.5 converters that are qualified with the Drobo Mini, 5D and 5N. Consult the Drobo.com Knowledgebase for a list of Enterprise SSDs and the 2.5″to 3.5″converters that have been tested and qualified for use in the B1200i. Note on Drive Performance: For optimal performance, it's best not to mix drives that have different rotational speeds (RPM). Faster spinning drives will maximise total system performance. Leveraging SSD technology for caching, tiering or as primary storage will provide the best performance when deployed as recommended. Notes: 4K sector drives are supported. Consult the Drobo.com Knowledgebase article describing 4K sector drive support for Drobo products. SLC vs. MLC. Enterprise-grade SSDs used to be made exclusively of expensive SLC (single-level cell) flash, but many now use more cost-effective MLC (multi-level cell) flash. You can use either SLC or MLC as long as they are enterprise-grade SSDs. Overprovisioned space. Writing to an SSD is a time-consuming task if data already exists in the flash. This is called a “program/erase cycle.” Also, cells in the flash can fail over time, creating the demand for new cells. These are two reasons why SSDs are overprovisioned and have more memory than what's presented to the system. That overprovisioned space is used to maintain high levels of performance and to replace cells that have failed. Enterprise-grade SSDs often have a higher level of overprovisioned space, increasing performance and extending the life of the SSD. SSD controller. The controller inside the drive is often different for enterprise and consumer-grade SSDs. Enterprise drives are tuned more for extended use to handle more write cycles and use reclamation features such as TRIM and UNMAP* to be alerted and data removal by the system to optimise capacity and performance. SATA vs. SAS. Similar to HDDs, SSD drives are available with SATA or SAS connectivity. The Drobo B1200i will support both SATA and SAS drives, but enterprise-grade SSDs are only available with SAS connectivity. Consult the compatibility list for supported SSDs to use in the B1200i. *In computing, TRIM and UNMAP commands allow systems to inform a solid-state drive (SSD) which blocks of data are no longer considered in use and can be wiped internally. Compatibility. While Drobos are designed to support a wide range of drive options, not all SSDs are the same. Make sure you check the SSD compatibility list to ensure that the drive you're considering works with your Drobo. Form factor. Most SSDs come in a 2.5" drive form factor. While this is fine for Drobo Mini, Drobo 5D and Drobo 5N have 3.5" drive bays. To use a 2.5" SSD in a 3.5" bay, a carrier is needed. mSATA. Drobo 5D, Drobo 5N, and Drobo Mini have an additional drive bay on the bottom of the chassis, the Drobo Accelerator Bay, to accept an mSATA SSD. This gives you the performance of an SSD to make reading small and randomly accessed data much faster while still maintaining the high capacity of HDDs. Using an mSATA SSD with HDDs in the standard drive bays is an ideal configuration for the new Drobos. The new Drobo B1200i, 5D, 5N, and Mini models all support SSDs as well as HDDs. While Drobo will work with most drive combinations, below are common and recommended drive configurations to consider. While planning to deploy one or more Drobo B1200i storage arrays, consider the following configuration scenarios. Note that 6 HDDs is the minimum supported configuration and fewer than 6 HDDs is not recommended. 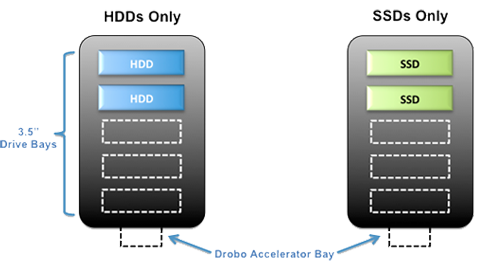 While planning to deploy a Drobo 5D or 5N storage array, consider the following configuration scenarios. While planning to deploy a Drobo Mini storage array, consider the following configuration scenarios.